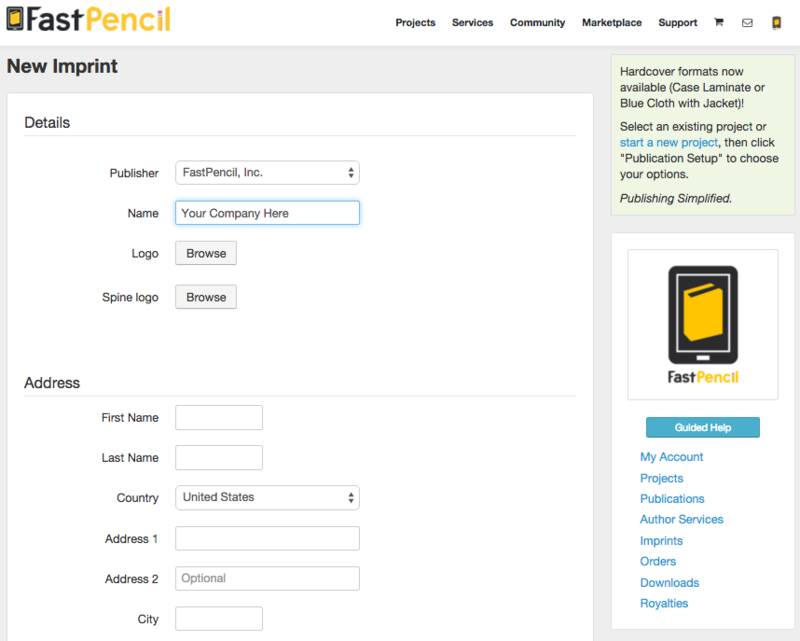 With FastPencil, you can Publish under your own company-branded imprint using our publishing platform. Publisher imprints cost $599 to set up and maintain. The benefit of setting up a Publisher Account is so that your custom-branded imprint will be displayed on marketing information (metadata) paired with your publication and will also be printed in your book and on the cover. To start a custom publishing business, create an imprint by selecting "Imprints" from your dashboard. The imprint is fully set up within about 10 business days. Then click the Create New Imprint button. On the New Imprint setup page, enter Imprint name and address and upload logos. Authors and Publishers can create a Print and e-Book from ONE PROJECT and can start here: https://fp.fastpencil.com/start. We'll create print and e-books for all readers on all devices (nook, iPad, kindle, Sony, Kobo, PC, MAC, and more) from your content. Alternatively, for PRINT PROFESSIONALS with access to Adobe Pro, use the DIRECT TO PUBLISH (DTP) PDF uploader utility to skip the writing and organizing tools and go directly to Publication Setup: https://fp.fastpencil.com/publications/new?. ****Please note , there is a separate tab for a PDF e-Book Upload. To obtain both Print and e-Book publications from the DTP uploader utility, the publisher must provide both files to perfect specification, as outlined within the site pages. When ready to publish, click the Publication Setup button and to be taken through a wizard to fulfill the metadata information for the publication. This data collection includes Title Page Info, a Description, Formats available (Print and/or eBook), Cover Setup (or upload), Pricing, Proofing, and more. This metadata will be paired with the book upon distribution. 1. Private Edition = $9.99. 2. FastPencil Marketplace only = $9.99. 3. Wide Distribution = $299 for 2 formats or $249 for one format, and the publication is distributed to the FastPencil Marketplace, Amazon, Barnes & Noble, iBookstore and Ingram Digital (hundreds of domestic and international channels). The above 3 options are the base price of the publishing packages, and each one will have additional charges for the cost of at least one print book, plus shipping, handling and taxes, if applicable. Once a NEW IMPRINT account is setup, the publisher will still be responsible for Publishing, Distribution and book sales, per title. The publisher imprint account handles book branding and metadata only and is maintained using the FastPencil publishing platform. Publisher imprints are only $599 to set up and maintain. Your custom imprint will be displayed on marketing information paired with your publication (metadata) and will also be printed in your book and on the cover. Purchase a publisher imprint to set up your business for only $599. Publish under your own company-branded imprint using our publishing platform. Whether you have 5 or 500 titles, the Publisher Account can help you get to market faster, leverage the power of eBooks and decrease your overhead costs. FastPencil is a powerful publishing platform that can improve publishing business workflows. Manage content and authors, create and edit manuscripts online, publish books and eBooks, and distribute directly to Amazon, Barnes & Noble, Ingram, Apple and more. WHEN READY TO PUBLISH, Click "Publication Setup" and continue until "Publication Settings"
Select an imprint to publish your title through. (FastPencil is the official distributor of record with FastPencil Publishing being the default imprint. 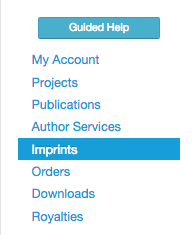 To publish under a custom publishing imprint, from your dashboard, click IMPRINTS.) Select from your available publisher imprints, when publishing and proceed to cart to checkout.